Denmark and the Danish spirit really caught my interest and I could definitely see myself living in Copenhagen! The quality of life, the vibrant culture and the architectural charm of the city meant that I enjoyed every minute of my 5 days in Copenhagen. While the city is quite large and spread out, most tourists will concentrate on sights in and around the two metro stations of Norrebro and Copenhagen Central Station. Because we had so much time in this city, we hotel-hopped and had the opportunity to explore different neighborhoods to put together this guide. 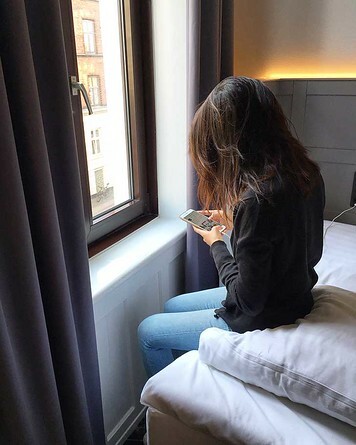 Keep reading for recommendations on where to stay in Copenhagen, Denmark! Home to the royal palaces, Tivoli gardens and colorful Nyhavn, most first time visitors to Copenhagen will want to base themselves here. Copenhagen Station is a convenient area to base yourself. It’s not the most picturesque area, but Copenhagen Station is home to both the metro and train, and it’s quite easy to take the metro from Copenhagen Airport directly to this station. If you’re looking to do day trips to Kobenhavn Castle (best known as Hamlet’s Castle) or Louisiana Art Museum, you can take the train at Copenhagen Central Station. Meanwhile, popular sights like Tivoli gardens are just a 5 minute walk north of the station. 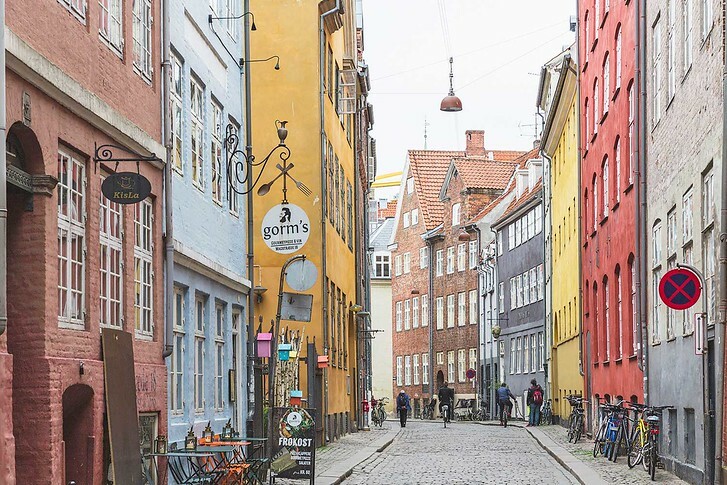 Some of the city’s coolest streets and shopping are found in Nørrebro, just northwest of the city centre. This was once Copenhagen’s red light district… but don’t let that deter you! 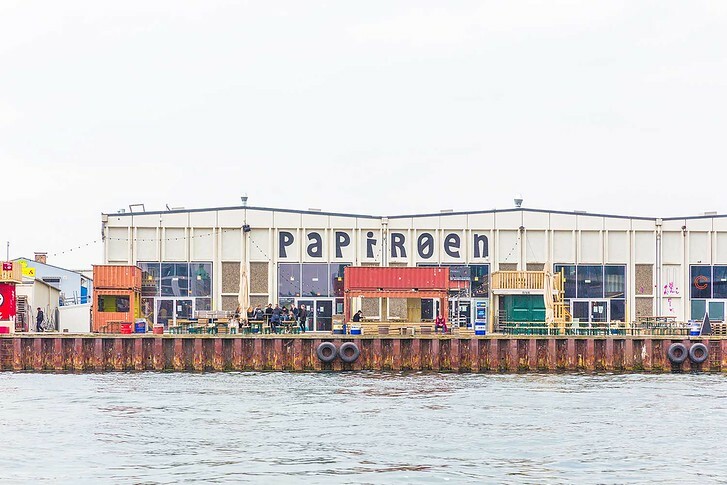 Today Vesterbro is the hippest, edgiest neighborhood known for the Meatpacking district of edgy restaurants and fun bars. I do have to caution that we saw a guy pooping on a public bench while we were on our way to our fine dining reservation… so perhaps don’t stay here if you’re traveling as a family with young children. Here’s a handy chart of our recommended Copenhagen hotels. All include free wifi and are known for comfort, good location and great customer service. Danish design is one of my favorites and I was particularly excited to find unique boutique hotels in Copenhagen with a thoroughly Scandinavian aesthetic. Clean, comfortable and utterly Danish, Ibsens is located in a charming neighborhood near Torvehallerne food hall. This hotel offers visitors complimentary happy hour, bike rentals and overall, lots of value. Centrally located, minimalist rooms and a sumptuous Nordic breakfast make it stand out. Additional photos of our room and our in-depth review can be read here. This intimate, retro hotel is stocked full of stylish Scandinavian furniture for a classic Danish stay. Just a 5 minute walk from Copenhagen’s Central train station with unique decor and furnishings. Stay here to be immersed in Danish lifestyle! A comfortable, cozy hotel featuring organic bath products and warm architectural design. 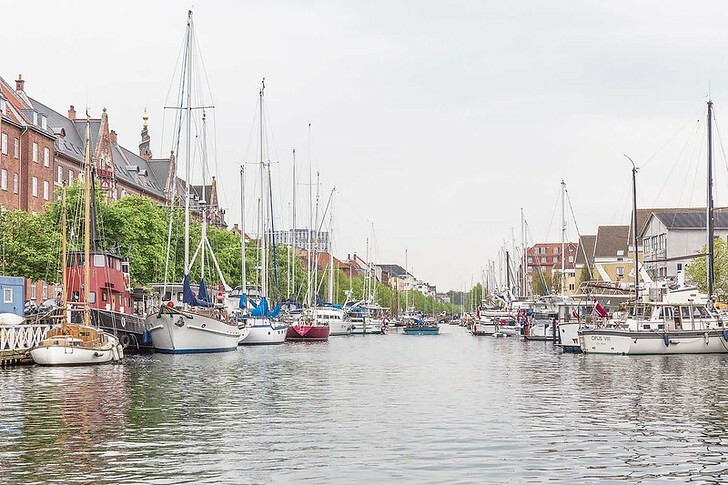 Babette Guldsmeden is located near the Little Mermaid statue, where most cruises to Copenhagen dock so this makes a great stay for cruise travelers. Rooms are small but packed with character and charm. 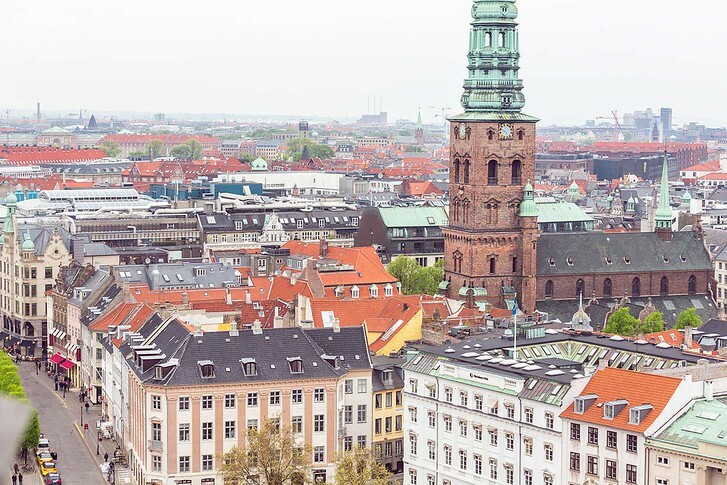 Read more: When is the Best Time to Visit Copenhagen? Scandinavia has one of the highest standards of living in the world and a hostel is a great choice for travelers on a budget! Here are the best 3 hostels in Copenhagen based on price, reviews and location. Zleep is newly renovated (as in, still being renovated while we stayed there) and rooms are very clean, modern and comfortable. The hotel is under a 10 minute walk to Copenhagen Central Station, making it a convenient sightseeing base for Tivoli and day trips. It’s also within walking distance of the Meatpacking District for dinner! Overall, this is a fabulous budget option but we’d recommend skipping the breakfast add-on. A&O offers travelers a mix of single, dorm and family rooms for all travelers looking to save. This hostel is run more like a basic hotel, with clean common areas, a communal kitchen and great breakfast. It’s not in the city center (based in hip Norrebro) but offers great savings. This hostel is unlike any hostel you’ve stayed at. Generator is a brand of new-age hostels, suitable for young backpackers and sophisticated retirees alike, with a focus on excellent design, inviting common areas and central city locations. 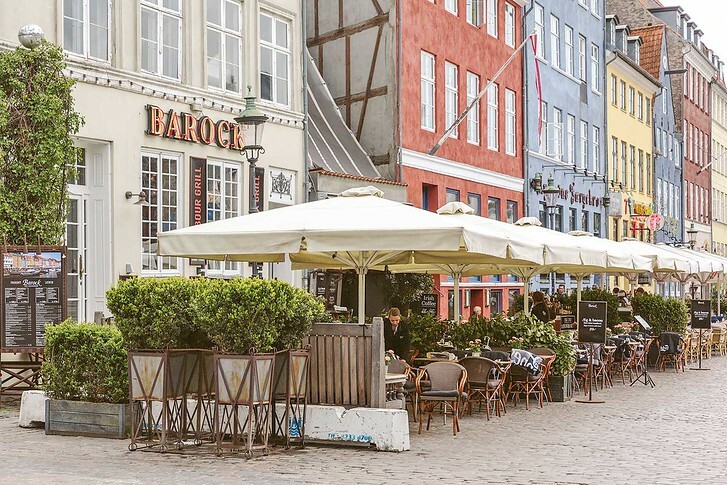 Their Copenhagen outlet offers excellent value as it’s located right in the city center near Kongens Nytorv square and surrounded with lively restaurants and bars. All the rooms are well-designed and solo travelers looking to mingle will love the stylish restaurant-bar where meals are served. Summer travelers will love the outdoor terrace! A friendly, well run hostel in the heart of downtown Copenhagen, Downtown Hostel was named ‘most popular’ by Hostelworld for 4 straight years! This hostel is located between Copenhagen’s main shopping area and Christiansborg Palace, making it a central sightseeing base for first time visitors to Copenhagen. If budget isn’t a concern, there are some truly fabulous hotels in Copenhagen to satisfy you. 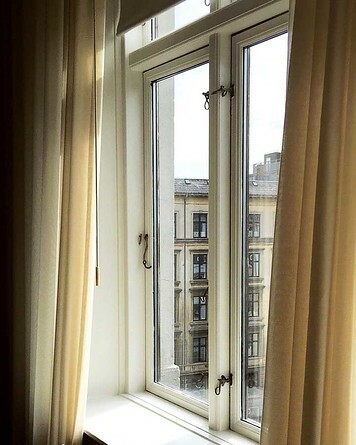 D’Angleterre is Copenhagen’s oldest, grandest luxury hotel located right on Kongens Nyrtov square.The hotel is beautifully furnished from the bed linens to the sumptuous bathrooms and is also located within Copenhagen’s prime shopping district. On-site restaurant Marchal holds a Michelin star – We also had dinner here, find our full dinner review with photos here. This gorgeous hotel is located inside Tivoli Gardens and offers a truly magical experience. Rooms have gorgeous antique furniture, delicious on-site restaurants and every whim taken care of by a fabulous concierge & staff have us raving about Nimb! This charming gem is located on the water in a popular tourist area abounding with restaurants and bars. 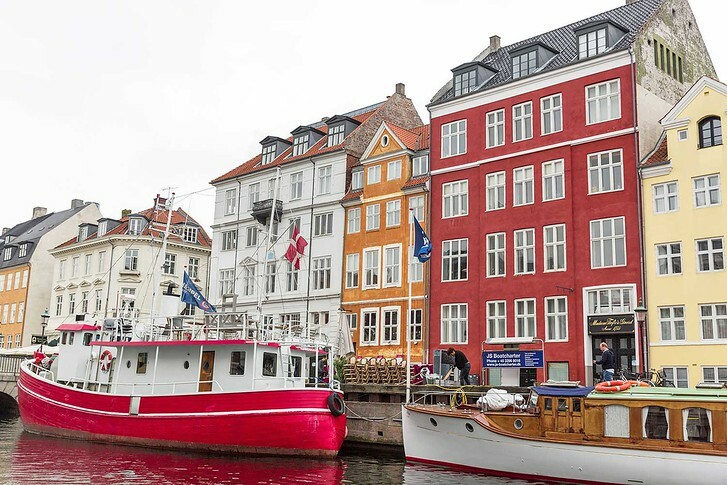 Right on the waterfront in Nyhavn, this hotel has prime access to the best of Copenhagen. 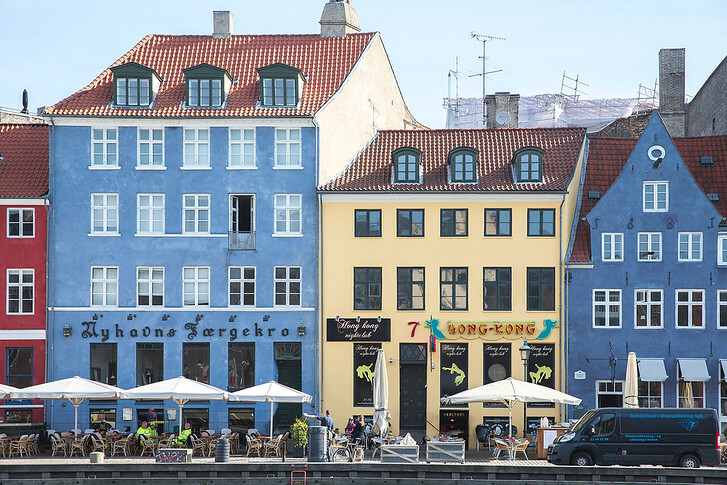 For a storybook Danish experience, stay at 71 Nyhavn. And that’s it! Our complete guide to Copenhagen’s best hotels to make the most of your stay. Whether you’re looking for ultra-luxurious comfort, the best location in town, or no-frills budget, these Copenhagen hotels are sure to please.